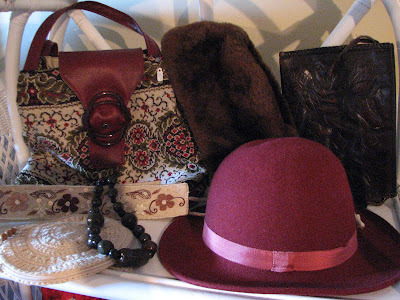 ~ Cider Antiques ~: Vintage Hats, Coats, Scarves and More! 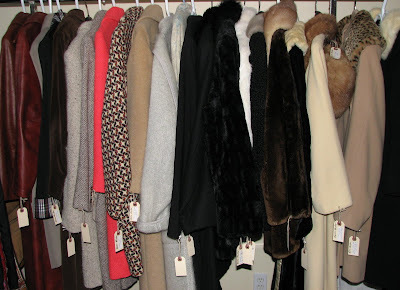 Vintage Hats, Coats, Scarves and More! I have two great white wicker shelves that I hope to take to the Vintage Clothing show this year. Just 5 days until November 15th. I'm wondering if I could put one on the roof of each car? They are really light . . . the problem is likely making it into the underground parking garage at the Chateau Laurier Hotel. Now that would be fun . . . being 1 inch too short of the required clearance. Maybe I'll check on those height limitations, LOL. Here is another preview of some items I will be taking with me. I have a large selection of wool and mohair hats. Beret's and Beanie style too. Great for winter! Some neat old 70's purses with matching accessories. 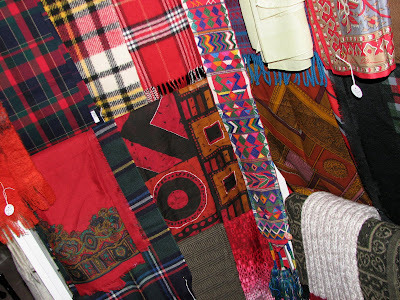 Bright Red and Plaid seem to have my attention this year! Great for early Christmas shopping. 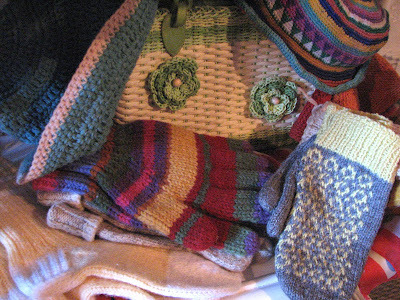 I have vintage hand knit hats, mittens, gloves and socks too . 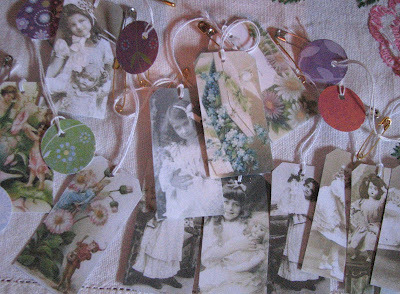 . .
My daughter and I have had fun co-ordinating the tags I bought on Etsy with each item. They come in all shapes and sizes. Some are absolutely works of Art. So pretty!!!! I use the big ones for labelling my coat racks etc. That way I get to keep them. My American neighbour delivered 2 commercial grade garment racks yesterday. Thanks so much!!! I bought them online at Target in the USA. They will ship packages as a "gift" to another address, so I had them shipped to a US location. It is amazing how expensive they are locally. Thanks so much Cathy for bringing them up to Canada for me! 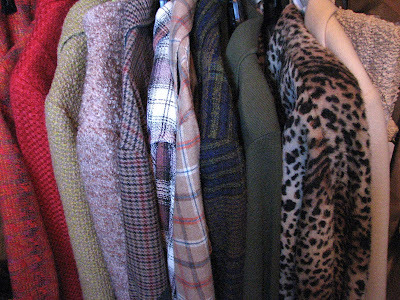 I need strong racks for heavy coats and these new racks are perfect. Good luck with everything, they are all lovely, I love the old purses. Take care. be well.Have fun with your Mom. Good luck Karen! 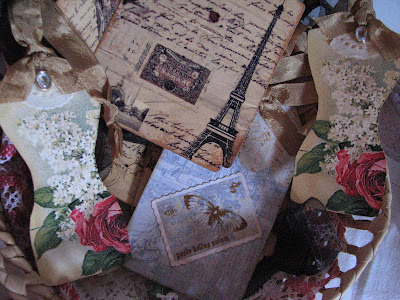 Your assortment looks fabulous, and the handmade tags are such a pretty touch! I have a very similar faux fur leopard coat... ;)love it! 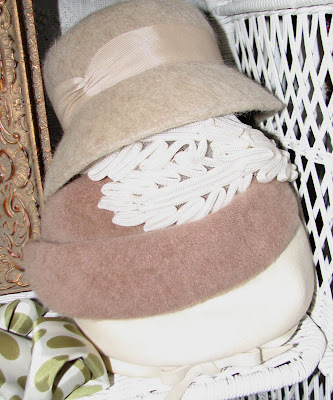 Your hats and scarves are to die for- I am a scarf and hat lover ;)) I wear them always! ALLLLLLLLLLLLLLLL!! !I LOVE THEY!!!!!! !...and a vintage style! 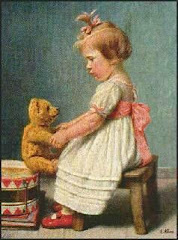 pop over to my blog, its award night! Wow Karen...what an amazing assortment! You should have a very successful showing. Hope you have a nice visit with your Mom.